The Malaysian state of Sarawak is to emerge as a main contributor to the nation’s growth by 2015, a study by Kuala Lumpur-based financial services firm Kenanga Investment has said. Sarawak has increasingly become the focus of major economic developments, the study pointed out, with the Sarawak Corridor of Renewable Energy (Score) being one of the most significant projects in the region. 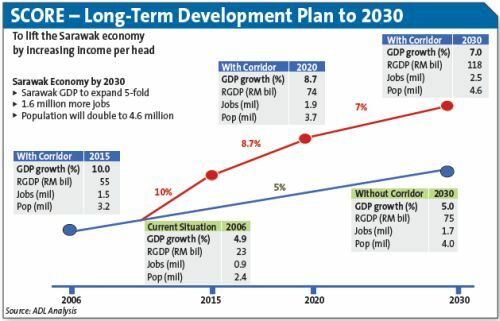 “With Score driving Sarawak’s economy, the state aims to achieve gross domestic product (GDP) growth of up to 10 per cent by 2015 compared to below five per cent without it,” the study said. “At the rate the Sarawak economy is going, the state could be among the top three largest contributors to Malaysia’s economic growth in the next few years,” it said. Kenanga said Sarawak’s contribution towards Malaysia’s total GDP could increase to slightly more than 10 per cent from its current 7.5 to 8 per cent share. “Sarawak is moving in the right direction as it will soon hit the half-way mark of the five-year 10th Malaysia Plan which began in 2010,” the study said. Budget allocations under the 10th Plan are being channelled towards improving infrastructures, particularly transportation, managing urbanisation and developing Sarawak into an energy development hub. “With Score, we believe Sarawak could exceed growth by five to six per cent by 2015, possibly outpacing the projected average six per cent national growth,” the investment firm added.